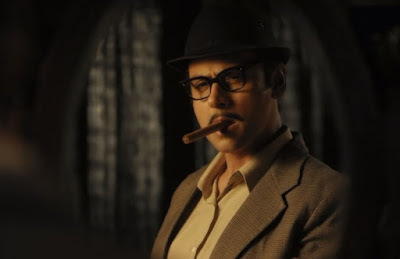 “Detective” is the sixth episode of the anthology television series Stories by Rabindranath Tagore (2015) that was created and directed by Anurag Basu. This episode, which was directed by Debatma Mandal and is based on the short story “The Detective”  that Tagore published in 1898, is played to relative comedic effect, but it has some more serious considerations, too . On the domestic side of things, Neelu loves Mahimchandra, but she expresses some jealousy over the fact that her husband has an attractive and intelligent female colleague, Harimati, working with him at the police office. But Mahimchandra assures Neelu that he has no thoughts for Harimati (even though we soon learn that the woman is rather flirtatious). In Mahimchandra’s professional sphere he wants to achieve glory as a master detective, in the fashion of his detective fiction heroes, Sherlock Holmes and Sam Spade . But he is frustrated by the dimwitted and unimaginative lawbreakers he captures. They never offer him a diabolical scheme for him to unravel and so demonstrate his skills as a master criminologist. What Mahimchandra is looking for is a villainous miscreant who has spun a false narrative for his criminal activities and which only Mahimchandra has the perspicacity to see through. But all he finds is thugs who confess to their crimes immediately on being caught. But one evening Mahimchandra sees a man out on the street outside his apartment window who fires up his suspicious imagination. The man appears to be lurking there out on a street corner every evening for no apparent reason. What is he doing there? What are his intentions? Mahimchandra, in disguise, approaches the man, whose name turns out to be Manmath, but his brief conversation with him reveals nothing. Manmath is cordial but evasive. Mahimchandra learns that Manmath is a college student; but the college examinations are finished and all the other students have gone to their homes for the student recess. Why is Manmath still hanging around on the street at night? Mahimchandra concludes that Manmath must be part of a criminal or revolutionary scheme, and he decides to masquerade as a student and befriend Manmath in order to uncover his evildoings. So he shaves off his mustache and rents a room in the same building where Manmath is renting. Now Mahimchandra’s sleuthing mind turns to how he can gain Manmath’s confidence and get him to reveal his secrets. The way to do that, he concludes, is to confess his own innermost vulnerabilities to Manmath – and that would mean introducing a woman into their discussions. So Mahimchandra fabricates a tale that he is in unrequited love with Harimati, who willingly agrees to cooperate in Mahimchandra’s ruse. 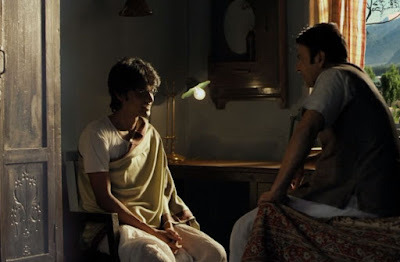 By confessing his innermost yearnings to Manmath, Mahimchandra hopes that the young man will reveal his own personal thoughts about his presumably criminal schemes. So he arranges to have some meetings with himself and Harimati in the company of Manmath so that he can encourage more intimacy. Things get more complicated and counter to Mahimchandra’s plans, though, when Harimati develops a crush on Manmath. All the while, Manmath remains surprisingly friendly to them, but he reveals nothing more about himself. 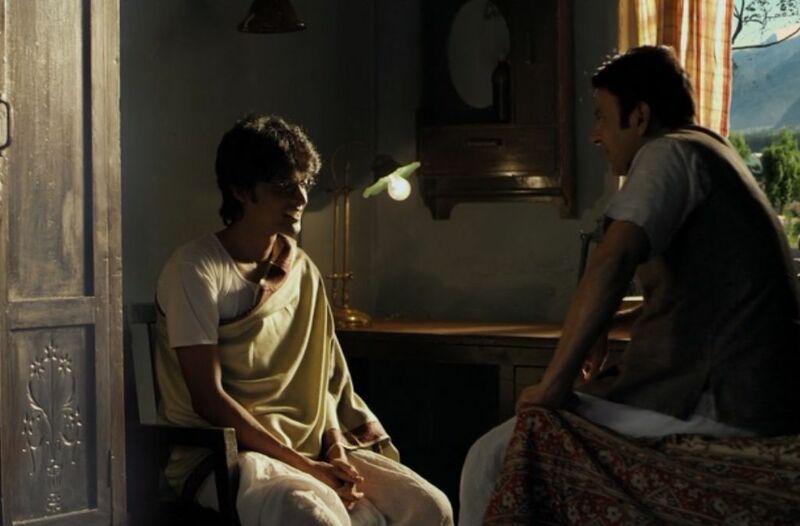 Finally Mahimchandra snoops around in Manmath’s room when his friend is away, and he discovers a note indicating that Manmath will meet someone in his room at 8pm while Mahimchandra is supposed to be out with Harimati. This, Mahimchandra presumes, must be a clandestine meeting between Manmath and one of his co-conspirators. So he arranges for himself and Harimati to burst in on this 8pm meeting and discover what these plotters are up to. In the event, though, there is a big surprise. When Mahimchandra bursts in on the meeting, he discovers that Manmath is not the kind of criminal he thought him to be. Everything is finally revealed in a letter that Manmath writes to Nilakshi. It turns out that Manmath is, himself, a sleuth – and perhaps a different kind of thief, as well. This filmed version of Tagore’s story is basically faithful to the original, but there are some differences. In particular, the character of Harimati is expanded in this version, which may slightly alter the viewer’s perception of Mahimchandra’s sincerity. It is generally true that all of us are continually constructing narratives, about ourselves and about the people we interact with. These narratives we store in our memories and represent our understanding of the world. A detective tries to construct, and then demonstrate the veracity of, a narrative about a criminal suspect in which the suspect is the guilty agent. In this respect both Mahimchandra and Manmath were detectives, but the supposedly guilt-proving narratives they constructed were both false. And what drove both of them to construct these false narratives was overweening pride and selfish desire. It is best to withhold conclusive judgement until all the facts are in and a more reliable narrative description can be constructed. Rabindranath Tagore, “Detective”, (1898), (trans. by Saquib Rahman and Rita Bullwinkel, Dhaka Tribune, 5 May 2017). Durga S, “Atithi, Maanbhanjan & Detective – Stories by Rabindranath Tagore (2)”. Writersbrew, (23 July 2015). The Film Sufi, “Bogart and Brando ('The Maltese Falcon' & 'The Wild Ones')”, The Film Sufi, (26 June 2011).